Uruguay is the Switzerland of South America, in many ways: when it comes to bank secrets, to the size of the country, and to the relative cleanliness compared to neighbouring countries. Uruguay has a similar accent to that of Buenos Aires, and a highly developed economy with demanding database users. Like yesterday in Argentina, I could today be part of the MySQL launch in Uruguay. Following our script from Argentina (meet press, present to customers, meet individual customers), the difference in Uruguay is that we mostly work through partners. 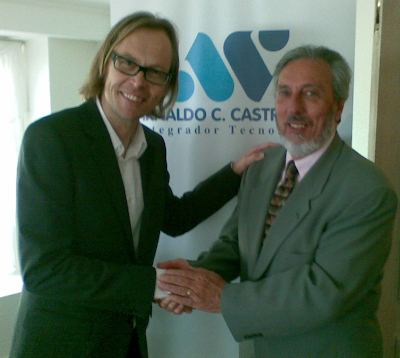 The most prominent Sun partner in Uruguay is Arnaldo C. Castro S.A. They hosted our customer event in hotel Cala di Volpe (Giuseppe told me this Italian name means "Bay of Foxes", and quite like Argentina, Uruguay has plenty of Italian immigrants). I met with plenty of representatives for Arnaldo Castro, until finally, I met with Arnaldo himself. I didn't dare ask him if he's the younger brother of Fidel, nor did I think of asking whether he is the uncle of Alexio, my Salsa teacher in Munich. Uruguay was a rewarding experience. Swift transport across "River Plate", which is just about the widest river I've ever seen. Or what other river does it take nearly an hour to fly across? You can hardly see the other side of the river from one "river bank", as below on the Ramblas (shore boulevard) on the Uruguayan side. 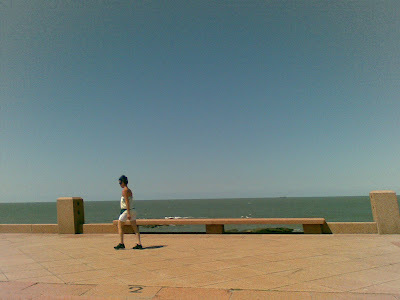 Do you see Argentina across the River Plate from the Ramblas in Montevideo? I don't. I also gave another presentation of my Spanish speech. At the end, I took questions from the audience, and proudly understood all four questions in Spanish, without translation. I am getting to feel more and more affinity for what in Sun speak is called "the emerging markets".